Dedicated to Maja Kajsa Svensson Runneberg, the homesteader who settled the Kansas farm on which the author grew up, this work of historical fiction is written in first person as if the journal of Kajsa, the protagonist. The author carefully researched her life in the late 1800’s in the Smoky Valley of Kansas. Many Swedes emigrated because famine, crop failure and social structure prevented Sweden’s farmers from earning a living. Large numbers of families sold their possessions to buy passage to America; many wound up in Kansas after the Homestead Act of 1862 offered free land to those willing to settle there. Kajsa and her husband Carl arrived with their infant daughter in 1868. They did not know the language, brought little money, and had no roof over their heads. Brutal winters, hot summers, crop failures, insect plagues, windstorms, and disease claimed many of the settlers’ lives. 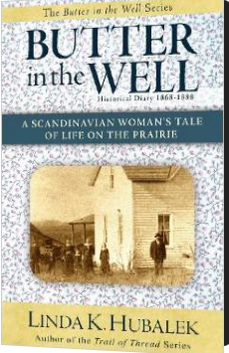 Kajsa’s story traces her journey, living underground in a sod house, making friends with neighboring Swedes, the arrival and death of family members. As they alternately take steps forward and face calamities, Kajsa enjoys the heights of joy and falls to the depths of despair when Carl is struck and killed by lightning. Time passes slowly, but within the next twenty years, the Smoky Valley will see the rise of churches, schools, towns, and even railroads. The reader wants to cheer and cry while following Kajsa’s journey. Hubalek says the book is appropriate for ages nine through ninety-nine. Those who have an interest in history, memoirs, or psychology will enjoy the book. Though the plethora of details provided sometimes become tedious, the photographs, maps, and recipes are a pleasant addition. Teachers interested in giving students a unique perspective on Westward expansion will find this book useful. If you enjoyed this post, please subscribe by clicking on the word Follow or by hitting the orange RSS Feed button in the upper right hand corner of this post. I can see this book fitting in really well with the homeschool unit we just recently finished on westward expansion. I’ll have to make note of it for when I teach the next children. Thanks for sharing this at Booknificent Thursday! A different perspective for sure. I enjoyed the in depth focus following the life of one immigrant family over a long period of time.